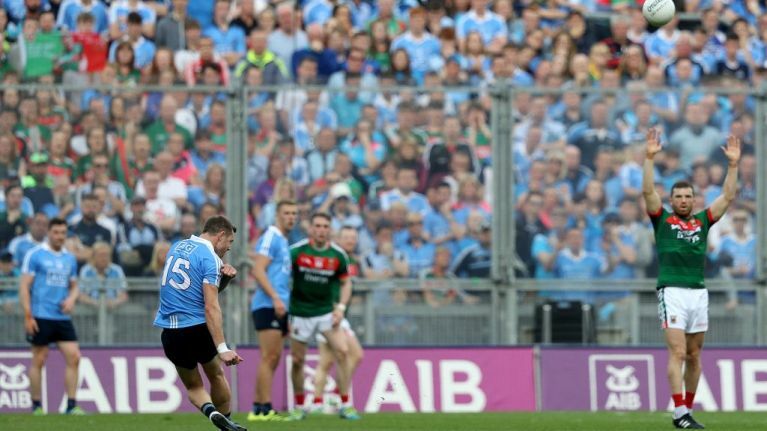 Dublin have won yet another All-Ireland Final after a game that saw nine minutes added on. Dublin's half-time subs Kevin McManamon and Diarmuid Connolly made the difference early on in the second half, with two points from the former helping the Dubs overturn the one point deficit. But Mayo's fierce resilience stopped Dublin from running away with it, and a massive save from David Clarke made sure Dublin didn't double their goal tally for the day. Two sendings-off for the one incident helped open up the game for the final 25 minutes. The ref had already blown the whistle for the foul that would see Dublin's John Small sent off, making the extrajudicial action taken by Donie Vaughan look especially needless. Both men left the field, immediately cancelling out any advantage that Mayo could have had going into the final stages of the game. After putting three points over the bar in the first half, Andy Moran turned provider, putting Lee Keegan clean through on goal. Keegan dutifully put the ball past Stephen Cluxton and give Mayo a one point lead. But as it had been throughout the game, Mayo couldn't pull far enough away from Dublin and soon the sides drew level for the ninth, then tenth time in the game. The deadlock was broken once again just minutes from time as Dean Rock rushed through and wisely fisted his sixth point of the game over the bar. Rock was outdone then by Mayo's Cillian O'Connor who levelled it with his seventh point of the game from distance. But Dublin won out again, sub Diarmuid Connolly won a free 40 metres from the goal and — where O'Connor had hit the post minutes before at the other end — Dean Rock put the ball over the bar in the last minute of the added six for his seventh point of the game, and a 1-17 to 1-16 win for the Dubs.